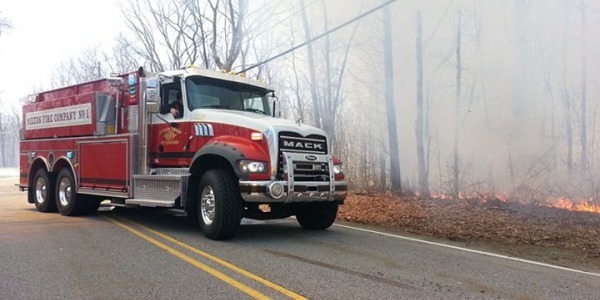 Despite April 2014's excessive rainfall, a few stretches of dry and breezy weather proved to be enough to push brush fires well above normal thus far this spring. In fact through May 4th, there have been 512 brush fires across the state, which have burned more than 6,250 acres. This is quite substantial compared to last year when only 792 acres burned to date. You may be wondering how these fires started? Research shows that only 1% of wildfires in New Jersey are sparked by lightning; the rest are caused by human activity whether accidental or intentional. The goal set each year by the State of New Jersey Forest Fire Service is to "limit the number of wildfires to under 2,000 and the acreage burned to less than 15,750"... this year is already nearing the halfway point. 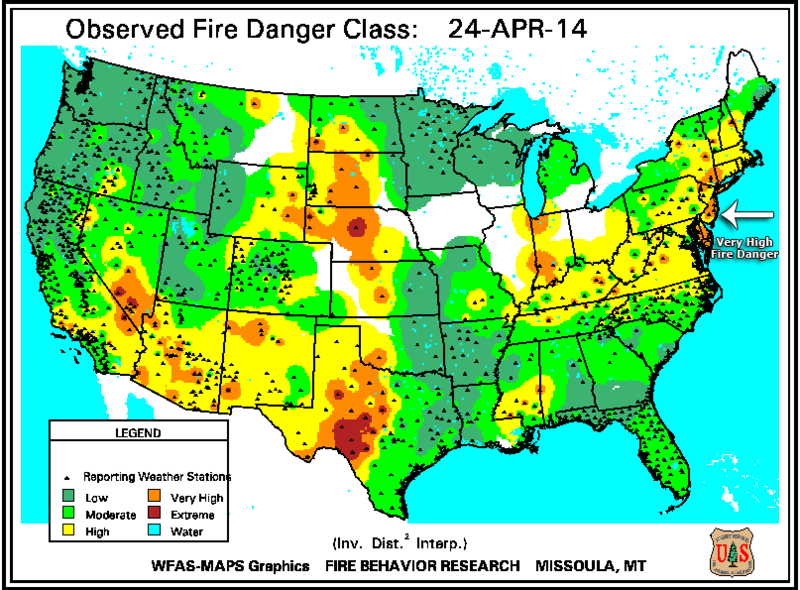 (Above left) Very low relative humidity levels of 17-25% and strong Northwest wind gusts of 30-35 mph spread brush fires easily on April 24, 2014. April 6th marked the first wildfire of the season, when a 1600 acre fire broke out through the Wharton State Forest in Burlington County, New Jersey. Amazingly, smoke spread all the way into parts of New York City on a southwest wind. Quickly on its heels, another fire on April 10th burned approximately 250 acres in Edison, NJ. This fire moved through the Raritan Center Industrial Park fueled by dry swamp grasses and 10-15 mph winds. Air support was even brought in to keep the fire from spreading to nearby businesses. Thankfully, firefighters were able to keep this blaze contained. Later in the month, on April 19th and 24th, red flag warnings were issued by the National Weather Service to prepare for upcoming fire danger. In New Jersey, red flag warnings are issued when the forecast minimum relative humidity will be at or below 30%, along with sustained winds or frequent gusts at or above 20 mph. These conditions must be present for 2 or more consecutive hours and when the 10 hour time-lag dead fuels are less than 10%. Sure enough on April 19th, several fires were reported, including multiple small fires in the Phillipsburg/Pohatcong, NJ area. As it turns out, the fires were started by dead leaves which ignited in a train's smokestack, then spread onto brush along the tracks. On the same day, a wildfire broke out along Cozy Lake road in Jefferson, NJ (see cover image above). Again, firefighters controlled the blaze, with help from multiple air drops (via helicopter). Finally, April 24th marked one of the most active fire weather days when several fires broke out across the state of New Jersey. The first fire moved its way through wooded areas near Beachwood, NJ burning 307 acres, forcing 617 homes to be evacuated and closing the Toms River intermediate school as a precaution (see below). Another 300+ acre fire also moved through Berkely Township on this day, with a 569 acre fire reported in Franklin Township, NJ. As with all the fires, the hard work from firefighters was a success, with no injuries or major residential damage! The cause of the fires remains under investigation by the NJ Forest Fire Service at this time. Thankfully, recent heavy rainfall along with new spring vegetation has put a damper on brush fires across the region. Hopefully this remains the case through the late spring and summer months.